I just try to use bandicam as seems lot of people talk, but I try to start create the video using microphone voice suddenly the program crash. I unplugged the microphone from computer and try to use same option, still the program is crashing. Then I try to use PrtScr to capture the message, surprising also that the PrtScr is not working while Bandicam is running. But PrtScr is able to be used again if the toggle off, I think this is strange. Please help me what should I do, thank you. And then, install the latest version of Bandicam and run it. If you still have the same issue, please refer to the following solution. I tried to uninstall Bandicam completely then re-install with latest version but the result is still same. I also followed your some FAQ, still not working. I do not un-install my graphic card driver as worry for re-install it not found the installer then I try for other screen recorder software they work for sound recording. But I want Bandicam to be used as only Bandicam that can capture all my monitor screen, others are unable even I apply for all screen recording. Please help this kind of problem. 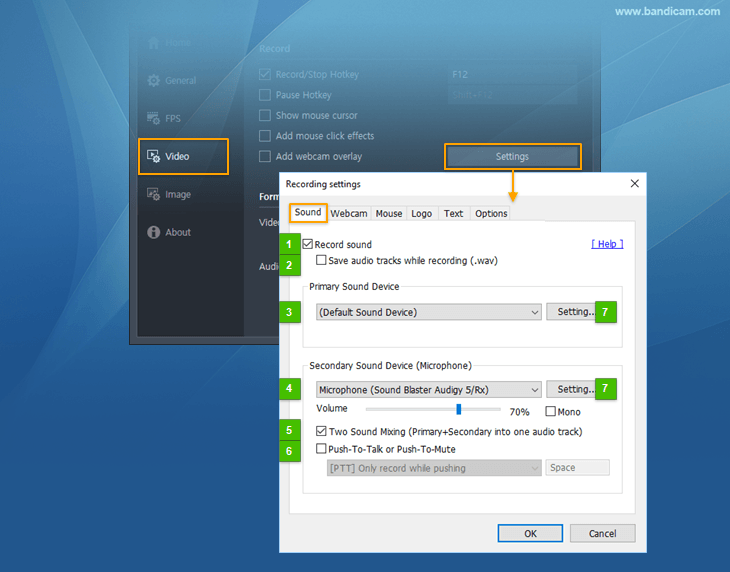 Do you have the same issue when you uncheck the "Record sound" option as shown below (NO. 1). Also, please let us know your recording target. Please refer to the following FAQ page.